Change by Us Phoenix is an online marketplace for community projects that allows you to share ideas for making the city better, and to turn those ideas into projects that have real impact. From tools to network and manage events to helping you connect with local resources, the site supports a number of ways to get involved. 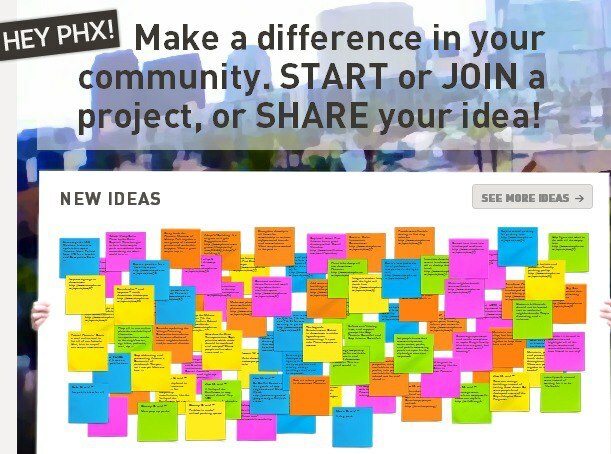 Share Ideas: Have an idea for how to make Phoenix better? Add it to Change by Us and connect with like-minded people and projects in your area. No idea is too big or small. Join or Create Projects: Find great projects in your neighborhood, or start your own! Use Change by Us’ powerful project management tools to recruit volunteers, promote events, and find in-kind donations. Build Teams: Change by Us allows you to tap into a network of people motivated to improve their communities. The site helps you find people by interest, location, and skills. You can even find people by items they have available to lend. Change by Us helps you tap into the power of your community. Find Resources: In addition to projects, Change by Us also maintains information on public and non-profit programs that can help your project succeed. Connect with city services and local knowledge. Posted on September 2, 2012, in Downtown Voices Coalition, Idea of the Day, Livability, Priority Issues, Volunteerism. Bookmark the permalink. Leave a comment.